NEW YORK, New York, February 10, 2012 (ENS) – The International Year of Forests 2011 declared by the United Nations General Assembly came to a close Thursday after a year’s worth of events and activities exploring the value of forests and ways people can protect them and contribute to their sustainable management. By declaring 2011 as the International Year of Forests, the General Assembly intended to create a platform to educate the global community about the great value of forests and the extreme social, economic and environmental costs of losing them. Forests cover 31 percent of Earth’s total global land area, shelter 80 percent of land-based biodiversity and provide livelihoods for more than 1.6 billion people. Forests store more than one trillion tons of the greenhouse gas carbon dioxide, but deforestation accounts for up to 20 percent of the greenhouse gas emissions that contribute to global warming – more than the emissions from the world’s entire transportation sector. “Each of us, all seven billion people on Earth, has our physical, economic and spiritual health tied to forests,” said Jan McAlpine, director of the UN Forum on Forests Secretariat, which coordinated activities throughout the year. 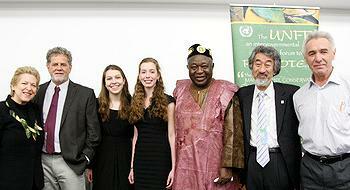 In a closing ceremony Thursday at UN Headquarters in New York, people who have made special contributions to protect forests in each region of the world were honored with a UNFF Forest Heroes Award. “We launched the UNFF Forest Heroes Awards for the International Year of Forests 2011 to identify and honor the countless individuals around the world who are dedicating their lives to nurturing forests in quiet and heroic ways. The program aims to spotlight everyday people working who make positive changes for forests,” McAlpine told a news conference. Michigan Girl Scouts Rhiannon Tomtishen, 15, and Madison Vorva, 16, were named Forest Heroes for the North American region for convincing the Girl Scout organization to stop selling cookies containing palm oil. Land clearance for oil palm plantations is linked to the destruction of Southeast Asian rainforests that has pushed the orangutan to the brink of extinction and threatens other native animals. The Girl Scouts organization has directed its bakers to use as little palm oil as possible, and only in recipes where there is no alternative. The bakers will to move to a segregated, certified sustainable palm oil source by 2015. The Scouts will buy GreenPalm certificates to support the sustainable production of palm oil. 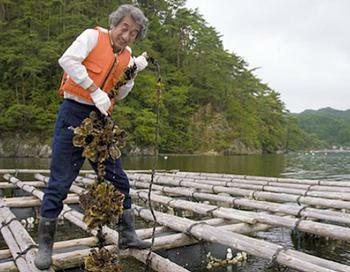 A Japanese oyster fisherman, Shigeatsu Hatakeyama, received the award for the Asia region, for planting a forest in the hills of Miyagi, Japan, which helped maintain clean water for his oyster beds. In 1989, Hatakeyama held his first “forests are lovers of the sea” campaign, cooperating with the mayors of communities along the Okawa River to plant trees. The new forest helped combat the discharge of pollutants from a marine product processing plant and sewage runoff. His efforts have resulted in a region-wide proactive movement to preserve the forest environment. Paul Nzegha Mzeka was honored for his work helping 30 communities in the African nation of Cameroon to protect their watersheds and conserve community forests through sustainable bee farming, education and reforestation. For the European region, Anatoly Lebedev was recognized for his work campaigning against illegal logging and destructive land practices in Russia’s Far East that threaten indigenous communities and Siberian tigers. 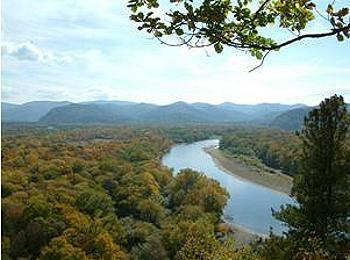 In Russia’s Far Eastern province of Primorsky Krai, informally known as Primorye, Lebedev is working to resolve the conflict between the logging company Roschinsky and local indigenous communities over illegal logging of Udegeiskaya Legenda national park, with the aim of conserving this valuable forest. In 2007-2008, Udegeiskaya Legenda suffered from massive clearcuts. The illegal cutting was performed by the Roshchinsky, which received permission from Primorye’s Forestry Department, although the agency is not authorized to approve logging in the national park. Most of the world’s population of wild Siberian tigers is found in this area, but there is great demand from China for its timber. This conflict has moved to national arbitration, and Lebedev is working with colleagues in Greenpeace Russia and in the national Association of Indigenous People of the North to conserve the forest. Paulo Adario of Greenpeace Brazil received the award for Latin America for his dedication to the protection of rainforests and forest-dependent communities in the Brazilian Amazon despite death threats and warring interest groups. 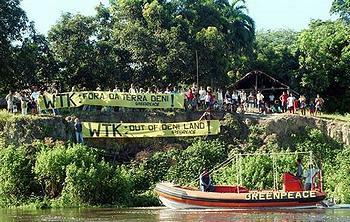 “I am delighted to accept this award in the name all the people fighting daily to protect the forest they made their home, and in recognition of the important work carried out not just by Greenpeace, but by all those striving to defend the Amazon and other forests around the world,” said Adario. For more than 15 years, Adario has led a team working deep within the Amazon rainforest as well as in the halls of Brazil’s Congress and the boardrooms of multinational corporations to defend the Amazon. 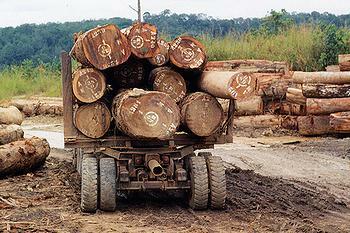 Among their accomplishments are the moratorium on international trading of Brazilian mahogany, the demarcation of their land by the Deni people, the creation of protected areas by Brazil, the soya moratorium and the cattle industry agreement in the Amazon – all of which are still in place today. The Forest Heroes Awards jury added a special award in recognition of the deceased couple Jose Claudio Ribeiro and Maria do Espirito Santo, two activists murdered in Brazil while trying to protect their natural forests. Clips from films entered in the first-ever International Forest Film Festival were shown, and the commemorative book “Forests for People” was launched with 75 articles from people in 35 countries.